Football is the All American sport and it certainly has a lot of fans. If you're the kind of person who always sits down with the family for Monday Night Football and can't wait until Superbowl Sunday rolls around each year then this crochet pattern roundup is for you. And if you're not so into the sport but have family and friends who are, these are great free football crochet patterns that you can work on while they watch the game! Celebrate football season by creating a crochet corkboard where you can post game days, scores and anything else that you want to share with your family about football. What a smart idea! Keep yourself cozy as you watch any football game thank to this wide ear warmer crochet pattern. Simple stitches form the earwarmer and some basic embroidery creates the detail that makes it look like a football. Whip up a small crochet football appliqué to add to any item that you're making for a fan of the sport. Crochet this onto a blanket, hat, hoodie or any other item, whether it's crocheted or store-bought, to give a personal touch to the gift. You could also make a set of these and string them together as bunting for a football-themed party. Bobble squares are a great way to give some easy three-dimensional texture to a design. This is a free crochet chart showing how to create a football design in bobbles. It can be used to create an afghan square, and you could include this in a larger crochet blanket. Note that this is a chart so you'll have to know how to read crochet charts to be able to use this free crochet pattern, which is available as a download through Ravelry. This free design is very adaptable so that you can make it in different sizes, and you could also make it in your favorite team colors rather than in the traditional football colors. This hat pattern has optional earflaps with braids, so it's cute but also cozy for those chilly nights when you're outside cheering on a football game, and you can leave the braids off if you want a more classic beanie in the football design. Show your love of the sport to anyone who visits your home with this free crochet placemat pattern shaped to look like a football. Make it a bit larger and it could also serve as a rug or welcome mat for your home. Why just watch football when you can play the game yourself? This crochet football can be tossed around just like the real thing. 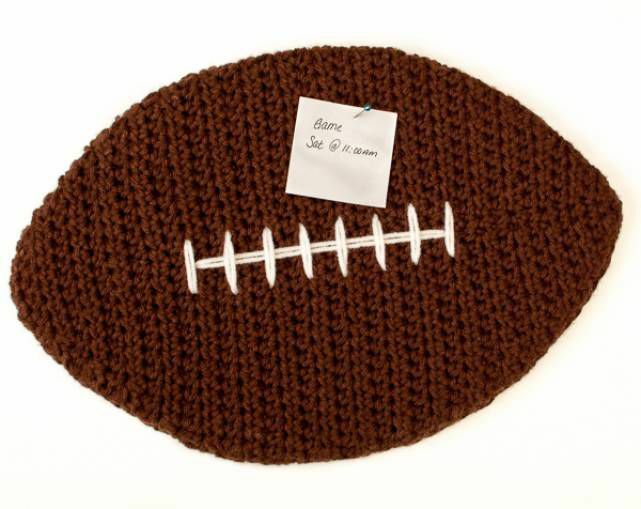 It's a stuffed crochet football that can be made to the same size as a regular football. If you have kids that can never put the ball down, this is a great safe option for indoor play! This is another option for people who want to make a stuffed crochet football that can be fun for kids to play with. It is a bit smaller but what really makes it stand out is the use of puffy paint to create the white designs that turn a basic brown ball into a football. What a great idea! Oui Crochet has a set of three matching free football crochet patterns. The ones that you see pictured here are adorable crochet baby booties made in the design of a classic football. There is also a matching free crochet newborn hat pattern. Put your little one in this set and they are ready to go to the game! There's also a little stuffed crochet football toy that you can make to give baby something to stay busy when the game gets boring. What goes better with football than beer? Crochet if you ask me! Even your drink can be ready for game day when you wrap it up in a football crochet cozy. Of course, you don't have to be a beer drinker to use this bottle cozy; try it around a soda bottle or water bottle, too.